Marguerite Dufrost de Lajemmerais was born in Varennes, Quebec, in 1701. She married François Youville de la Découverte and was early widowed. 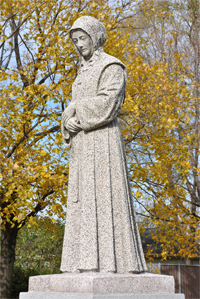 In 1737, she founded the community of The Sisters of Charity of Montreal. In consideration of her exceptional life of devotion and compassion for her brothers and sisters of the human family, she was canonized by Pope John Paul II in 1990. Her Mortal Remains rest in the Basilica of Saint-Anne in Varennes, where a chapel is dedicated to her. The portrait of Marguerite d’Youville by François Beaucourt was based on a portrait sketched by Philippe Liébert on the day after her death in 1771. Twenty years later, the artist was also inspired by the memories of her companions. He shows us the face of an older woman marked by life. Marguerite’s son Charles, the author of her first biography, described her thus: “She was one of the most beautiful women of her time. She had light brown hair, a rosy complexion, keen and expressive eyes, and perfectly even features. She was tall and very distinguished looking.” According to Charles, Marguerite d’Youville loved life’s pleasures. Her contemporary the Sulpician Montgolfier, who admired her organizational abilities, said that she possessed an unusual intelligence. Beyond these traits, the innumerable trials of her life developed in her a deep spirituality that revealed itself in her compassion for the poor. Her letters reveal a gentle firmness, a precise understanding of business matters, and a good judgement; these qualities enabled her to restore and courageously administer the General Hospital of Montreal during the difficult years at the end of the French rule. In Marguerite d’Youville’s time, the spelling of proper names frequently varied. François Ladécouverte, called Youville, was the son of Pierre You, Sieur de la Découverte, who was thus named because he had taken part with the Cavalier de la Salle in the discovery of Louisiana. On his wedding contract he signed his name as François Youville De la Découverte. It was Marguerite d’Youville’s biographer, the Abbé Étienne-Michel Faillon, who added the “d” to Youville for reasons of euphony. As for Marguerite’s family name, it was sometimes spelled Dufrost de la Gemerais and sometimes de la Jemerais. Her bursar in Paris asked her to sign it always in the same way; but in the last years of her life, she signed her name as M.M. Lajemmerais, Widow Youville. The spirituality of Marguerite d’Youville can be situated within the wider stream of Catholic reform in France in the seventeenth century. A number of mystics and theologians came out of this movement, including Saint Jean Eudes, Saint Vincent de Paul, and Jean-Jacques Olier, the founder of the Society of the Priests of Saint-Sulpice. The members of that Society were the Lords Proprietor of the island of Montreal from 1659. They were in charge of the parish of Notre Dame; and one of them, Louis Normant de Faradon, became the spiritual director of Marguerite d’Youville after Gabriel du Lescöat. Marguerite d’Youville left to her contemporaries and to future generations a spiritual legacy marked by an unconditional compassion for the poor and an inextinguishable faith in God the Father and His Providence. Her example will remain forever a source of inspiration for those who are working for the coming of a civilization of love and justice. As a result of a promise Marguerite made to obtain the healing of her spiritual director, Louis Normant de Faradon, PSS, and at the request of one of her companions who wanted to see a representation of the Eternal Father, she ordered from France a painting depicting the Eternal Father. In our century of images, this request might seem a little naive; but in the eighteenth century, the painting served as a focus of meditation for the little community. For Marguerite, God was a Father on whom she could count. 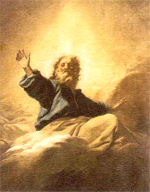 The name given to God under the aspect of his care for us is the Providential God, or Divine Providence. It is the way in which God shows his care in the concrete events of our lives through intermediaries who are attentive to needs of the poor and marginalized. This faith in Divine Providence made Marguerite bold in her choice of life. Through storm and tempest, she stood firm, knowing that God’s help was assured to her since she was seeking the well-being of the poor. She testified to this frequently. The Archives of The Grey Nuns of Montreal contain many of the letters written by Marguerite d’Youville since she kept copies of the letters she sent. One part of the letters is the epistolary evidence of the famous quarrel she had with Intendant Bigot, who wanted to close the General Hospital of Montreal and move the residents to Quebec City. Throughout her letters, Marguerite defended her Hospital with great intelligence and determination. She replied to all the arguments put forward by Bigot, who was contesting the amount of money spent on the renovations for the maintenance of the boarders. One can feel her skill as an administrator and her determination to save her work. Another part of the letters is addressed to her bursars in France who were trying to recover the money lent to the King during the War of Conquest. She also wrote to members of her family who had returned to France. There is a great deal of humanity in her words. Sometimes, she felt a little overwhelmed by events, but she was never discouraged. Many people have committed themselves to following the example of Marguerite d’Youville “to love Jesus Christ and the poor”. Even today, God is still calling people to this way of life. The Grey Nuns of Montreal are open to collaborating in the Church with the vocational ministry to encourage young people and not-so-young people to recognize God’s calling. Religious life is undergoing a process of renewal in its way of life and its participation in the Church and the world. There is deep questioning of what can emerge from these new kinds of life projects. How can we follow in the footsteps of Marguerite d’Youville? We can do so as persons consecrated by vows, as men and women Associates of Saint Marguerite d’Youville by promises made, or as partners in her charitable works. The Associates of Saint Marguerite d’Youville was founded by a committee of laypeople and Sisters in 1983. The Associates are committed to sharing the spirituality and mission of the Grey Nuns in their own lives. They are inspired by the principle of God the Father’s compassionate love as revealed by Marguerite d’Youville. Their goal is to help people in difficulty around them, in addition to healing people in their family and professional lives. Each year, they renew their commitment and take part in activities of spiritual renewal and other apostolic projects. A number of laymen and laywomen from different backgrounds share the mission and values of The Grey Nuns of Montreal. Thanks to them, the spirit of Marguerite d’Youville is very much alive and thriving. Whether they are Associates, volunteers, or co-workers, these people are following the example of the Foundress. Like her, they are serving the most deprived people with the same devotion and the same vision. Beauchamp, André, Libres propos sur Marguerite du Frost de Lajemmerais 1701-1771, Centre St-Pierre, 31 octobre 2001. Cliche, Marie-Aimée, Les pratiques de dévotion en Nouvelle-France, Québec, Les presses de l’Université Laval, 1988. Faillon, Étienne-Michel, p.s.s., Vie de Mme d’Youville, fondatrice des Sœurs de la Charité de Ville-Marie dans l’Île de Montréal, en Canada, Villemarie, chez les Sœurs de la Charité, 1852. Fauteux, sœur Albina, L’Hôpital général des sœurs de la Charité (Sœurs Grises) depuis la fondation jusqu’à nos jours, Montréal, Les sœurs Grises, 1916. Ferland-Angers, Albertine, Vie de la vénérable Marie-Marguerite du Frost de Lajemmerais, veuve d’Youville, Montréal, Librairie Beauchemin, 1945. Lessard, Renald, Se soigner au Canada aux XVIIe et XVIIIe siècles, Hull, Musée canadien des civilisations, 1989. Mitchell, Estelle, sgm, L’essor apostolique, Sœurs de la Charité de l’hôpital général de Montréal, Sœurs Grises (1877-1910), Tome IV, Montréal, éditions du Méridien, 2000. Mitchell, Estelle, sgm, En toute disponibilité, Sœurs de la Charité de l’hôpital général de Montréal, Sœurs Grises (1910-1935), Tome V, Montréal, éditions Continentales, 1996. Mitchell, Estelle, sgm, À travers vents et marées. Sœurs de la Charité de l’hôpital général de Montréal, Sœurs Grises (1936-1960), Montréal, éditions du Méridien, 1999. Sattin, Antoine, pss, vie de Madame Youville, Québec, Québec, 1930. Sœurs Grises de Montréal L’Hôpital général de Montréal, Tome premier, 1915, Tome II, 1933, Tome III, 1938. Tard, Louis-Martin, Marguerite d’Youville. Au service des exclus. Montréal, collection Les grandes figures, XYZ éditeur, 1998. Tardif, Estelle, sgm, Marguerite d’Youville, le cri des pauvres, Montréal, Éditions Bellarmin, 2001.